Last week, I discussed some of Boston’s best art museums, including the Institute of Contemporary Art, the Isabella Stewart Gardner Museum, and the Museum of Fine Arts. Many of these museums are a fun activity for older kids, but this week, I’m continuing the museum theme (after all, it’s still May, which means it’s still National Museum Month) and covering a couple of museums and activities that are specifically tailored to families. Many of these are right in Boston, but a few require a short drive, making them the perfect day trip. 1. 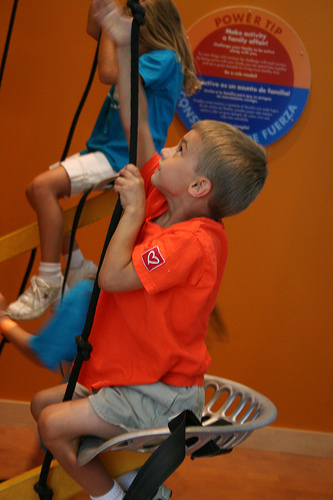 Museum of Science: With an array of fun, interactive exhibits exploring animals, ecology, astronomy, the human body, and more, the Museum of Science is great for curious kids. I visited the Butterfly Garden a few months ago and loved the vibrant assortment of exotic plants and stunning butterflies. Other current exhibits explore birds, bees, x-rays, fossils, and computers. 2. Boston Children’s Museum: I have fond memories of exploring the Boston Children’s Museum with my parents and younger brother. Although the Children’s Museum recently underwent renovations, some of those same exhibits that I loved as a kid are still there! My favorite was the Japanese house, which is a reconstructed two-story silk merchant’s house from Kyoto. Other highlights include the Recycle Shop, KidStage, and the Global Gallery, which showcases children’s exhibits from around the world. On Fridays from 5pm to 9pm, the museum admission is just $1. 3. New England Aquarium: With adult admission just under $20, the New England Aquarium is not cheap, but it is a fun way to spend an afternoon. In fact, the Aquarium attracts over 1,3 million visitors per year! Here you can explore richly colored reefs, watch harbor seals in their outdoor seal exhibit, and learn about marine animals from around the world. The Aquarium’s website offers a wealth of entertaining and educational material, including the penguin underwater webcam.